After all those Cinco de Mayo Mexican festivities a little while back, I kind of became obsessed with Mexican food. I’ve always loved guacamole (for obvious reasons) and maize and tomato and rice and all those classic Mexican (or at least in my non-Mexican eyes classic) ingredients. The reason this post comes this late though is something many of you will probably also have problems are familiar with: finals week, deadlines, essays, revisions, etc. 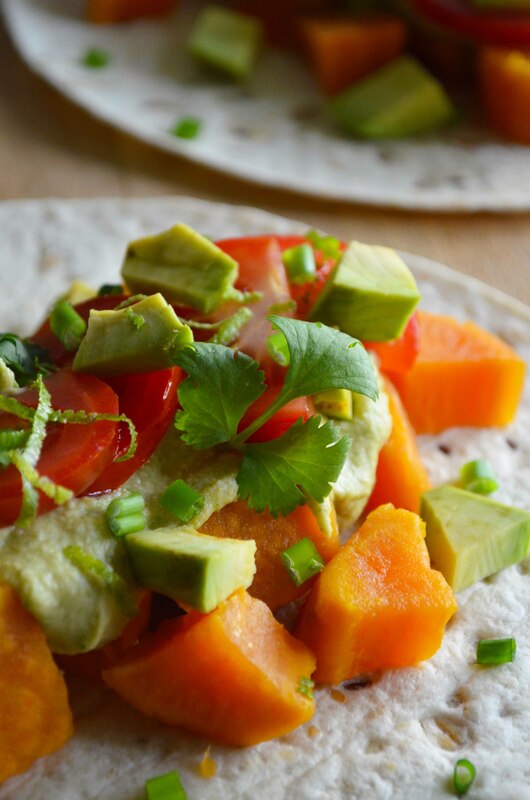 However, I do have this awesome burrito wrap recipe for you, with another great hummus recipe. 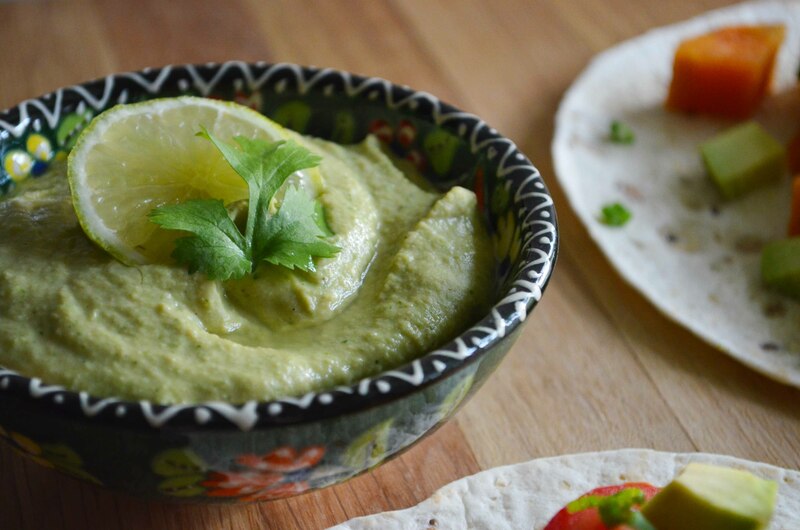 I’ve made this cilantro and lime hummus soooo many times, and it never fails! Also, I’ve made it oil-free this time while keeping the texture super smooth. So yum! 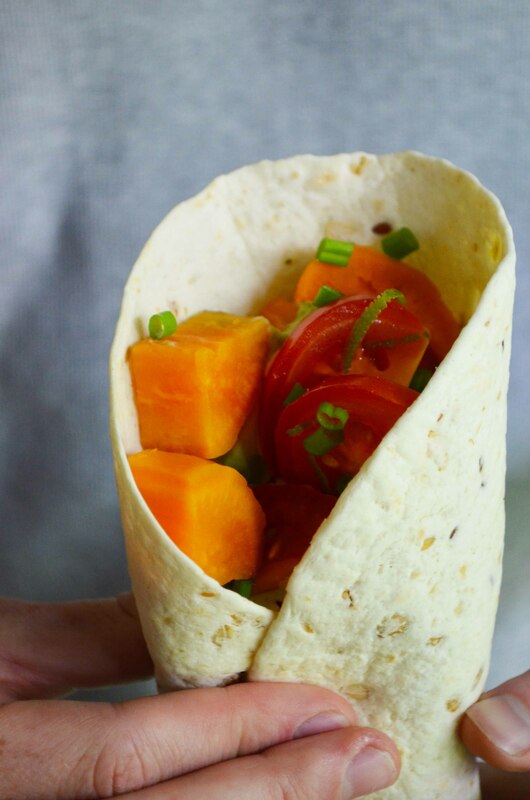 I think these burrito wraps would be great for a picnic this summer, just store them in some parchment paper with a pretty ribbon around them and they will be too cute. Also, I think you could easily take these to work/uni for lunch. Just make sure to keep the veggies separated from the hummus and the wrap and assemble them when you’re ready. 1 can cooked chickpeas (270 gram), do not throw away its liquid! 1. Zest and juice the lime. 2. Add all ingredients, except the cilantro, to your food processor or blender. Do not drain the chickpeas, but add its liquid to the blender as well. 3. Start with a little bit of cilantro, and blend it in with the hummus. Add the cilantro step by step, as a little goes a long way, and it is easy to overdo it. 4. If the hummus tends to be a bit dry after blending, you can add some more lime juice or water, depending on your preference. 1. 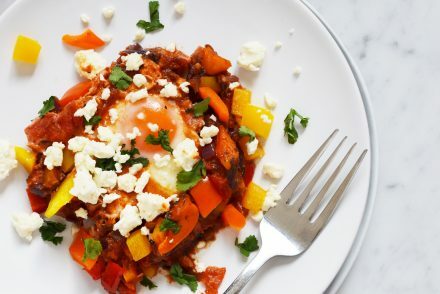 Start by peeling the sweet potatoes and cutting them up in 1 cm x 1 cm x 1 cm cubes (or smaller). 2. Steam the sweet potato cubes, or cook them in a little bit of water until slightly tender but still firm. Do not let them cook too long, as they are best when still a bit firm. It will probably take 8 to 15 minutes, depending on the size of the cubes. 3. Meanwhile cut up the tomatoes and avocado in small cubes and slice up the spring onions. 4. After cooking, let the sweet potatoes cool and dry a little, and sprinkle them with some cinnamon and chili. 5. 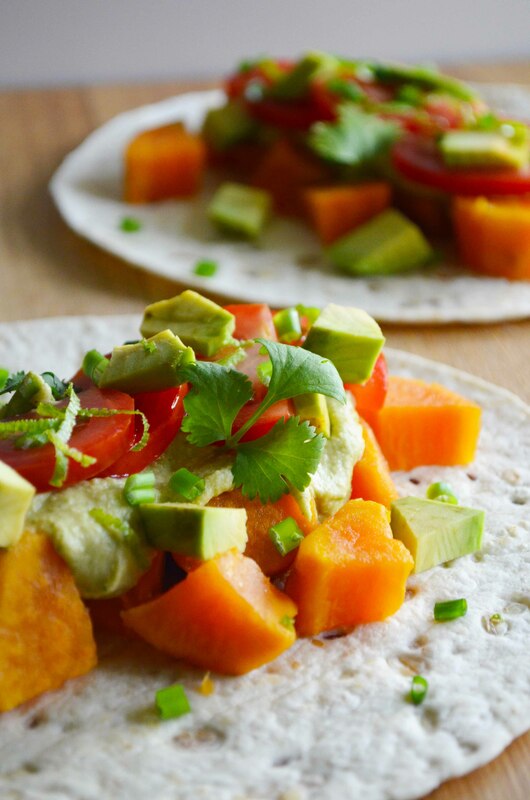 Take a wrap and assemble them with a dot of lime-cilantro hummus, some tomatoes, avocado, spring onions and sweet potato cubes. Finish them off with some extra lime zest and cilantro.